The system being simulated is a level control system of a liquid tank. The controller function is PI (proportional plus integral), in the form of the LabVIEW PID Advanced function. The outflow Fout(t) is assumed to be the same as the pump control signal u(t) (both in unit of m3/s). Here is an instructional video where a previous version of the present simulator is used as an example: Flow Smoothing with Buffer Tank. 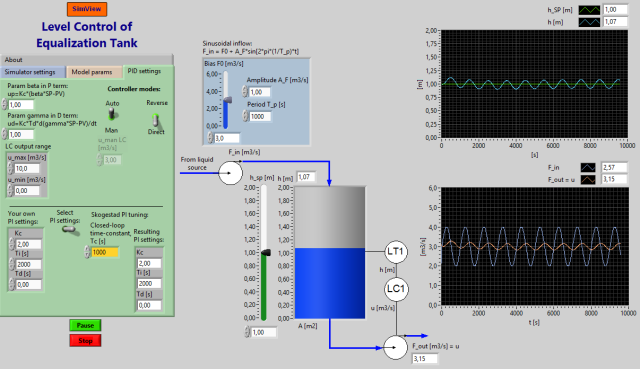 The aim of this simulator is to demonstrate the use of level control to obtain equalization (or buffering) of flow. Flow equalization is important in e.g. wastewater treatment plants. Compliant or soft level control is used to obtain a proper equalization or smoothing of the varying inflow. 1. Observe in simulations how the closed-loop time-constant, T_c, in the Skogestad PI tuning method affects the flow equalization or smoothing property of the level controlled tank. 2. It can be shown (assuming the level controller is a P controller) that the maximum variation in the level, dh_max, due to a step change of amplitude dF in the inflow is not larger than T_c*dF/A. Verify this in a simulation. Updated 18 October 2017. Developed by Finn Haugen. E-mail: finn@techteach.no.